Paris-Manhattan DVD Review Paris-Manhattan is probably best suited for real Woody Allen fans who need something to fulfil their waiting time till his next film. Otherwise, best watched when you want something short and sweet. When you hear the title of Sophie Lellouche’s latest film, Paris-Manhattan, you think you have it all figured out. This little French comedy with lead Alice Taglioni on the cover looking over her shoulder at Patrick Bruel, could only be about a girl from Paris who falls in love with a man from Manhattan and she has to try and make it work. We are all fooled. Paris-Manhattan is about a thirty-something year old chemist, Alice (Taglioni) who’s obsessed with Woody Allen and his films (hence where the “Manhattan” in the title comes from). She has imaginary conversations with Allen in which he offers her life advice that come in the shape of quotes from his films. Alice is constantly being set up with suitors. It may well be that the one she is meant for was always in front of her, but she may need Woody Allen to be the judge of that too. 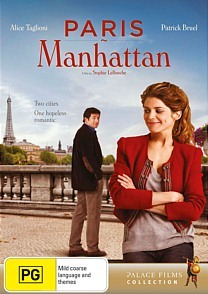 Paris-Manhattan is a very simple type of film. It does not require much thinking power nor is it a film you will be thinking much about when you finish watching it. It doesn’t offer enough to make it particularly memorable. Although it is a bit of a treat for Woody Allen fans. Allen lovers will be more appreciative of this film than those who either dislike him or have not seen much of his work. The presence of the great personality is the point of difference between this film and many other French comedies. There is nothing wrong with French romantic comedies, but there are a great many that can be particularly stereotypical (as is the case with romantic comedies in general, not just French ones). Paris-Manhattan is stereotypical and you can see Alice’s fate coming from a mile away, but her overwhelming love of Allen gives this film a quirky edge and makes it more enjoyable that it would be without him. There are some funny moments in the film, although they are not laugh out loud moments. They are more amusing than hilarious. The film is also very short at 74 minutes and because it is so short, it feels like there is not true substance to the film. It is not very deep at all and everything feels skimmed over at lightening pace. The one major part of the film which is extremely confusing and just a tad menacing, is that when Alice is having her imaginary conversations with Allen, she is engaging in a conversation where she is speaking French and Allen is speaking English…? We assume she must know some English after seeing so many of his films, but why when she is watching his films does she then watch them with French subtitles? And there is no hint that Allen should know fluent French. It works for the film, but just seems ridiculous (even though having a conversation with a Woody Allen poster is anyway) that two people are engaged in a conversation where they are speaking two different languages. Alice Taglioni gives a fine performance as the film’s protagonist. She doesn’t have any spectacular moments, but her best moments are when she is engaged in simple conversation. She is completely natural in these scenes and her facial expressions and body language are as though you are not watching an actor at all. Patrick Bruel does the best he can do with his role. The main thing is that both of these characters, particularly Alice, are likable and can be enjoyed. Paris-Manhattan is probably best suited for real Woody Allen fans who need something to fulfil their waiting time till his next film. Otherwise, best watched when you want something short and sweet.